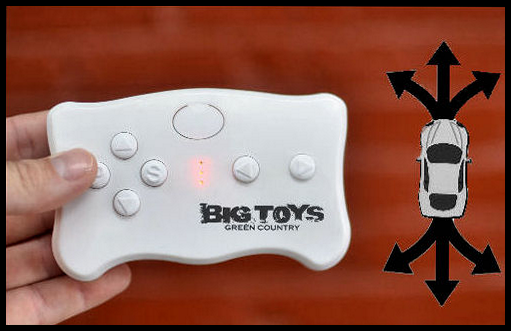 Exclusive Features from Big Toys Green Country, include upgraded 12V SLA battery and drive motors. Parental remote control has the ability to operate in forward, reverse, left. and right. best purchase got it for my son 1st birthday and he loves this car.. I bought this over a year ago and my daughter still loves it. The battery is holding a great charge after a year of use! Controlling it by remote control is just awesome. I bought it for an 8 month old and now she's almost able to drive and steer it on her own. Its a great vehicle to grow into! Great little car. Won't see another in your neighborhood! Exactly as described! Had an issue with the car not functioning correctly at first but one of the guys at Big Toys worked relentlessly to determine the issue. Car is working great now! My 3 year old loves it! Thanks guys for all your help! Lots of Fun the New remote system is the future !! I give it 4 stars because im very picky and the thing I would change is it come with a floor mat like some of the other cars.. and rubber tires , but for the price this is amazing !! very nice car,i was suprised how much power this thing has! i have a 2 year old and this was his present! he loves it! This is a beautiful product, just like the real thing. The fire motor is the truth. Click the button below to add the 12V BMW X6 SUV Ride On Car w/ remote control & leather seat -White to your wish list.